This post contains affiliate links. Please see my Disclosures page for more information. Oh meal planning... For some of us, it's done fairly quickly. For others, it's a nightmare that you don't want to relive every week (or how ever often you go shopping). So what about when you are overspending and drowning in extras in your refrigerator and pantry week to week? A solution, you say? Nah, it's not going to work for me. I'm a mess. Oh, but it can! You just have to put in the effort. Some of you may need to put in more effort than others, but you can do it. I have faith in you! Let's explore 3 essential rules for getting organized so your meal planning skills can get to level 10! This is a must. Even if your budget never changes, you need to periodically make sure that what you are spending is working or not. If you have $120 budgeted for groceries every week, but you are consistently spending $150 a week, something isn't adding up. Either you are buying $30 worth of "extras" every week, or you are spending that much on true essentials. I say "true essentials" because even though you may need that bag of Dove chocolates, if it's making you go over your budget, you might need to re-think things. Keep your receipts for a month and analyze them. Are you consistently spending $30 a month on paper plates? While convenient, if you're tight on funds, that would be something to let go of. Yes, it creates more dishes. As a SAHM with no dishwasher at the moment, I get it. I do dishes all. day. long. But, I save $30 a month buy not using paper plates every meal every day and it works for us. Whether you start something like Taco Tuesdays, Meatless Mondays, etc. or you take your bullet journal/planner and make a list of 30 meals to rotate through, starting a meal rotation can keep you organized and not eating the same meals over and over every week. While I like to spice things up a bit, having a meal rotation lets me know what my food budget is going to look like for the most part. I don't know about you, but I know I fail at this sometimes. There are weeks I get what I call "Pinterest happy" and create a meal plan based on recipes I've found on Pinterest. While this is great to do every now and then, doing a full week of it hurts my budget and leaves me with stuff in my refrigerator and pantry that may never get used again. Before starting your meal plan, see what's available. Did you buy 6 zucchini for a meal last week and only ended up using 3? Make something early in the following week with those 3 zucchini. Did you buy extra rice last week because they were 2 for 1? Make a casserole dish. Don't go to the store and buy a ton of food for the week when you can still use some of what you have in your pantry. Getting ready to meal plan doesn't have to be difficult, but doing these 3 things before you get started will not only help your budget, but your sanity as well! How do you get ready to meal plan? 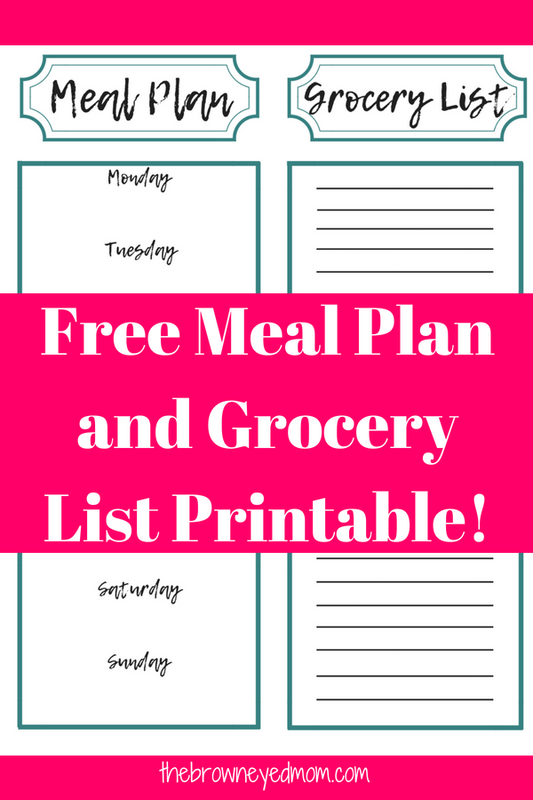 Sign up for my email list below (or click the printable's image above) to get your free meal planning and grocery list printable!